Lock in a great price for Kahlua Boutique Hotel – rated 8.1 by recent guests! One of the receptionists was very friendly and helped us a lot with suggestions to visit places in the island and because of her we discovered one of the best beaches we've seen in our trip to greece. They let you leave your luggage in the last day after you check out and they also let you have a shower so you don't have to face the trip back all sweaty. It was very nice to be able to take a shower after a day at the beach and before our flight. They provide towels and shower gels. The breakfast is very nice and you do it in the beach bar of the hotel so you can have breakfast while watching the sea outside. The hotel is also very central and it has a lot of nice restaurants in the area. We were on our honeymoon, and everything was just fine! The staff, the food, the landscape, everything was GREAT! Thank you for the pleasant time, and all the care you gave us. If we can, we will definitely return. Second year staying here absolutely love this place. Can't wait to come back next year. Spacious room. All you would need and little more comfy. I couldn't help but wonder what I was missing on the spa side of the hotel, but once we got going we figured out it was more than one needs after a great evening at the beachside restaurant. It is a very casual environment. Our waitress and desk person worked really hard to be responsive and helpful. Breakfast was all you need to get you going. מיקום מעולה , צוות המלון מאוד נחמד . נקי ומסודר . אירוח מקסים, שירות נפלא (תודה מיוחדת לג'ואנה ששדרגה לנו את החדר), המיקום מעולה, המלון מתאים במיוחד לזוגות שמחפשים שקט ושלווה. מי שיכול שיזמין חדר עם מרפסת לים, שווה כל רגע!!! Die Lage ist unglaublich! Das Personal unheimlich freundlich und sehr, sehr hilfsbereit. Unser erstes Zimmer war wirklich nicht schön, aber auf Nachfrage bekamen wir sofort ein anderes und das war ganz zauberhaft. Kahlua Boutique Hotel This rating is a reflection of how the property compares to the industry standard when it comes to price, facilities and services available. It's based on a self-evaluation by the property. Use this rating to help choose your stay! 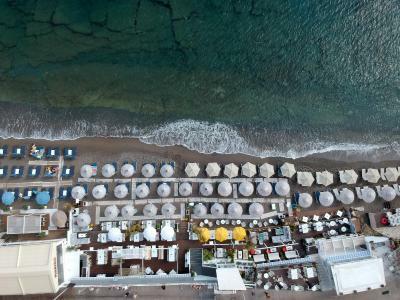 Offering a restaurant and a private beach area, Kahlua Boutique Hotel is located in Hersonissos. Free WiFi access is available in all areas. Each room here will provide you with a satellite, flat-screen TV, air conditioning and a fridge. Featuring a shower, private bathroom also comes with a hairdryer and free toiletries. Extras include a safe and bed linen. Some rooms offer Cretan Sea views. At Kahlua Boutique Hotel you will find a 24-hour front desk and a bar. Other facilities offered at the property include a nightclub and a shared lounge. The hotel is 1.2 mi from Lixnostatis Folk Museum and 2.8 mi from The Crete Golf Club. Aquaworld Aquarium is 6.2 mi away and Heraklion International Airport is 12 mi away. When would you like to stay at Kahlua Boutique Hotel? This air-conditioned room includes a satellite, flat-screen TV, fridge and a bathroom with a shower, free toiletries and hairdryer. Kindly note that this budget room offers no views and no balcony. This twin/double room features a electric kettle, tile/marble floor and air conditioning. House Rules Kahlua Boutique Hotel takes special requests – add in the next step! Kahlua Boutique Hotel accepts these cards and reserves the right to temporarily hold an amount prior to arrival. Kindly note that discounted rates are offered to guests at the property's bar and beach facilities. Rooms are quite small in size and parking is a 2 minutes walk away. After walking around the area, we saw hotels at better rates with what seemed to be bigger rooms too. Location is good and hotel is quite clean. My cell phone went missing which seemed more like stolen. It is a sheet of rock after heavy terrain to get into the Sea. I swam at night and I'm not sure I would have went into the water to begin with. It wouldn't surprise me if it was like the water slide in Cancun that we all swore we would never use and were certain that we never did. The noise is awfull. When we arrived they said we had an upgraded room and it would be a room with side view to the sea. We were happy with this but then it came the night and we realized that the music from the beach bar that belongs to the hotel was very much audible from our room. Not just that all the cars, motorcycles and people passing by, we could hear it all. When we complained to the person in the reception the answer was that they couldn't move us to another room and that they were in the city center and we could try turning the air conditioning on in order to mask the outside noise with AC noise. In the morning the noise is no better as you can hear all the other guests heading down for breakfast. So, if you want a good night's sleep this is not the hotel for you.